Bongeka had a very difficult childhood. Her parents died when she was 3 months old and she lived with her aunt and uncle who abused her. She didn’t have the basic things she needed growing up, like school uniforms and stationery or books. “I had this anger inside me, I hated my parents for dying and leaving me so young. That anger grew inside me for many years”. Through the difficulties Bongeka somehow managed to do well at school and pass her Grade 12. Bongeka has noticed changes in her eldest daughter since joining the group. She used to go out with friends all day and not come home for food. When Bongeka confronted her and asked why she doesn’t come home her daughter would just keep quiet and cry, she never liked to talk or be involved at home. So Bongeka sat her down and spoke to her about what was bothering her, using the skills she learnt in the group. Now her daughter includes herself in the home and helps her mother in the kitchen and with the cleaning – without Bongeka having to ask. 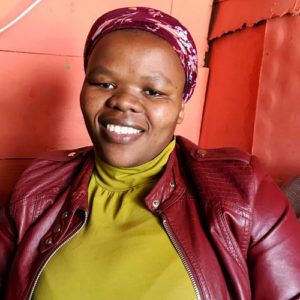 Although her daughter is still quiet Bongeka knows how to deal with her stubbornness and feels she is a good parent thanks to Circles of Support. She learnt the difference between discipline and punishment and communicates all these things with her kids. Bongeka’s husband was extremely frustrated with her for shouting at him all the time, he didn’t understand why. The group has taught her to communicate with her husband. She explained her upbringing to him and told him what was bothering her. He now understands where all her anger comes from and is trying his best to make her happy. They now have a very happy marriage. Bongeka pays it forward wherever she can. She doesn’t want to see any child suffer and is always looking out for the kids in the community, helping them with food and clothing. She feels the group gave her the strength to support others and wants to help all children who struggle.